The eagle, globe and anchor emblem has been a part of the Marine Corps Uniform since 1868 and became the official emblem of the Marine Corps in 1955. The eagle represents the proud nation, the US, that the Marines defend. It stands at the ready with their coastlines in sight and the entire world within reach of its outstretched wings. The globe represents their worldwide presence. The anchor points both to the Marine Corps' naval heritage and its ability to access any coastline in the world. Together, the eagle, globe and anchor symbolizes commitment to defend their nation - in the air, on land and at sea. The Marine Corps adopted the motto “Semper Fidelis” in 1883. 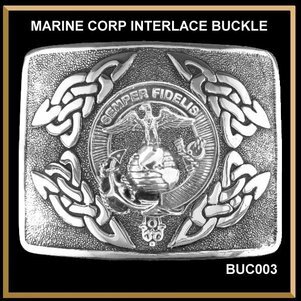 “Semper Fidelis” is translated from the Latin "Always Faithful" or "Always Loyal" and signifies the dedication that individual Marines have to “Corps and country,” and to their fellow Marines.